In "Speakers Bureau" we offer brief biographies of the CURE members who are willing to accept interviews and/or represent the organization and the subject of reparations as speakers, panel members or workshop participants. For information on how to invite one of the CURE speakers to your event, please E-Mail Us. Ida Hakim is the founder and CEO of Caucasians United for Reparations and Emancipation (CURE). 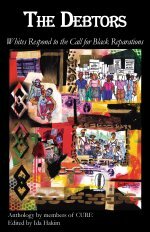 Ms. Hakim co-authored and edited CURE's latest anthology, "The Debtors: Whites Respond to the Call for Black Reparations." She also co-authored and edited CURE's first book in 1994 as well as a magazine published by the organization from 1995 to 1997. She has appeared on numerous television and radio programs, and participated in panels and spoken at universities. Ferrell Winfree is a native of East Tennessee. She is a former Board Member of Knoxville Project Change, which is an anti racism initiative fighting institutional racism. She also helped establish the Race Relations Center of East Tennessee as one of the founding members, serving on the original Board of Directors. She is a an Officer of CURE as well as Director of CURE Christian Outreach. Donna Lamb serves as the Communication Director of CURE. Ms. Lamb, an award-winning journalist living in New York City, has been a passionate supporter of justice to African Americans for about two decades. She believes that when any honest, fair-minded person sees--really sees--the colossal injustice that has been committed in this country against people of African descent, both during the enslavement and afterwards, he or she couldn't help but see reparations as just. Larry Yates first participated in anti-racist activism in high school days in the 1960s, when he was active in fair housing organizations in the Virginia suburbs of Washington DC, and has been active as an activist and organizer in numerous anti-racist campaigns since that time. Hugh Esco currently serves on the campaign staff of the Power to the People Committee, Cynthia McKinney for President 2008 campaign. He also served as an assistant to the former Congresswoman during her tenure in the U.S. Congress. Hugh has been active with CURE since 2001, supporting the work with organizational development, participating in crafting its Supreme Court Amicus brief in the corporate resititution lawsuit brought by the Restitution Study Group and presenting on panels for CURE. Jeff Hitchcock co-founded the Center for the Study of White American Culture in 1995 and continues today as Executive Director. In 2003, under his guidance, the Center started the White Anti-racist Community Action Network, an online community of more than 1,200 members. He is author of the book, Lifting the White Veil: An Examination of White American Culture in a Multiracial Context. Minton Brooks has helped launch a 'Truth, Reconciliation, and Repair' initiative within the Unitarian Universalist faith community. With the assistance of the white antiracist organization that he leads, Allies for Racial Equality (ARE), Minton is organizing to show the film Traces of the Trade at 100 congregations and ten district assemblies, and help congregations research their complicity and links to slavery and the slave trade. Molly Secours has been writing, speaking, facilitating discussions and making videos about racism, white privilege, reparations for slavery and disparities in the criminal justice system since 1996.